Powers/Abilities: Pavane can project energy blasts. History: Pavane is a mutant. (Avengers I#377 (fb)) - Pavane was a student in Transia, when he met Wanda and Pietro Maximoff. He found that the twins tended to stay close to each other and avoid contact with others. Pavane tried to approach Wanda, but Pietro always pulled her away. Developing an infatuation with Wanda, Pavane secretly used his powers to destroy their boat while they rowed down a stream. Pavane jumped into the stream to save Wanda, but Pietro saved her instead and told Pavane they didn't need his help. (Avengers I#377 (fb) - BTS) - Pavane traveled to America sometime after Pietro and Wanda, though he couldn't afford to move out of a "benighted section" of town in New York. He settled down, was married. (Avengers I#377 (fb) - BTS) - Pavane's wife was killed by bigoted neighbors, after which he decided to use his children to destroy their entire neighborhood. 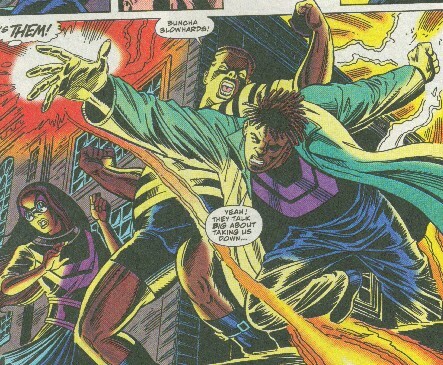 (Avengers I#377) - Quicksilver encountered the Circle of Pavane while fighting a group of New York mutaphobes. They brought him back to their father, who revealed his past history with Pietro, accusing him of keeping him at a distance b/c Pietro planned to come to America and he didn't want any other mutants from from Transia to remind him of his past. When Pietro argued to the contrary, Pavane and his children incapacitated and restrained him, after which Pavane and Ampere began to use their powers to ignite the building in which they lived. However, their power damaged the clock on top of the building, which fell, destroying the floor below them and leaving them trapped in the burning building. Brawler freed Quicksilver, who raced through the building, extinguishing the blaze with the resultant wind. However, a large beam then collapsed Ampere, leaving him near death. Pietro was dazed from the previous battle and couldn't see clearly, so young Wanda rode atop his shoulders, directing him to the hospital. While Ampere was being treated, Pietro lectured Pavane about passing on hatred to his children, though he mentally noted the irony in his statements, due to his own past actions. Comments: Created by Joey Cavalieri and Grant Miehm. I'm not sure that Pietro and Wanda ever attended a formal school in Transia. They lived amongst a group of traveling gypsies. Also, if Pavane is their age, it seems odd (though certainly not impossible) that he would have children in their late teens. The age of his kids was never specified, and so he either might have had children at a very young age, or perhaps he used his powers to artificially age his kids. They certainly did seem to behave in a particularly mature fashion, though neither did anyone else in the story. It also might be that he could create lifelike humanoids under his control, and that his "children" were actually artificial beings. Pavane's reasoning about Pietro is also faulty, as Wanda and Pietro had never planned to go to America, but rather went there on the spur of the moment after a later encounter with Magneto. The rest of his explanations are nonsense, too, but I don't have the energy to continue analyzing them. Then again Pietro never did actually confirm anything that Pavane said, so he might have just been a nutjob. Ampere (far right) can generate and project electricity and light. Brawler (center) has superhuman strength and durability (Enhanced human to Class 10). Wanda (far left in the large picture and immediate left) has superhuman vision, the details of which are not known. She must wear sunglasses to protect her from excessive input.